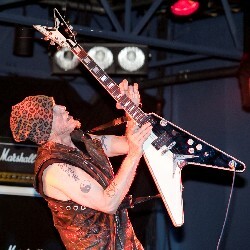 Those of you following former Scorpions and UFO guitarist Michael Schenker no doubt remember the days of his notorious no-shows in the 1990s. Well, several hundred faithful Wisconsin fans came and SAW the master of the Flying V show up and tear through a tight set at Scatz in Middleton on August 4th. While MSG’s vocalist was plagued with P.A. problems, Schenker and veteran rock drummer Carmine Appice were in fine form, treating the assembled metal maniacs to a slew of UFO tunes at the sets’ end: Lights Out, Rock Bottom, and Doctor Doctor! It was a night not to have missed.